The global financial services industry is a competitive space, and smaller jurisdictions must be savvy and strategic if they want to gain a foothold. 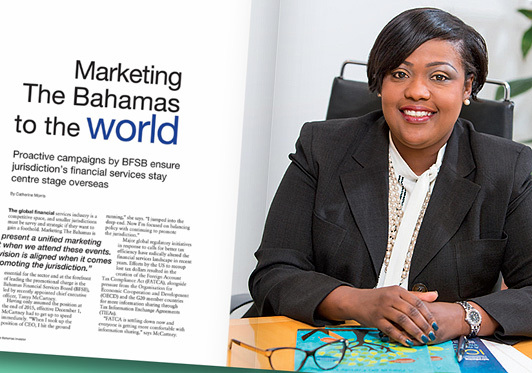 Marketing The Bahamas is essential for the sector and at the forefront of leading the promotional charge is the Bahamas Financial Services Board (BFSB), led by recently appointed chief executive officer, Tanya McCartney. Major global regulatory initiatives in response to calls for better tax efficiency have radically altered the financial services landscape in recent years. Efforts by the US to recoup lost tax dollars resulted in the creation of the Foreign Account Tax Compliance Act (FATCA), alongside pressure from the Organisation for Economic Co-operation and Development (OECD) and the G20 member countries for more information sharing through Tax Information Exchange Agreements (TIEAs). But if anyone has the requisite experience to handle the demands of the role, McCartney does. An attorney and chartered banker, she first joined the financial services sector in 1999 as legal counsel and compliance officer for The Private Trust Corp. Positions in Butterfield Bank, the UBI Group and RBC Caribbean followed. Prior to succeeding former CEO Aliya Allen at the BFSB, McCartney worked as assistant general counsel for regulatory compliance at Baha Mar. She is also a keen advocate of the sector outside of her professional life, having served as president of the Bahamas Institute of Financial Services for the past six years. In collaboration with the Ministry of Financial Services, the BFSB has stepped up its overseas promotional activities in recent years, with very encouraging results according to McCartney. In 2016, the BFSB and the ministry are representing The Bahamas at events in Saint Lucia, São Paulo, Athens, Amsterdam, Mexico, Panama, Shanghai and destinations around the US. It’s an ambitious schedule that McCartney says takes a lot of time, planning and stakeholder discussion to pull together. But the BFSB is not always content with the role of attendee or sponsor. In 2010, the organization began hosting its own briefings, the Landfall events. Today Bahamas Landfall enjoys an established footprint in Latin America, Europe and China and will continue to promote The Bahamas’ brand in those markets in the coming year with stops scheduled for Mexico, Brazil and Asia. Maximizing the time on tour is often not just about attending and hosting events. For Minister of Financial Services Hope Strachan, the work doesn’t end when the event does. The ministry often meets privately with industry firms to extend their reach beyond the conference halls. “Not only do we go to the conferences and seminars, we set up private meetings with firms on their own turf and meet with people in the industry. We find out what we can do to assist them,” she says. Strachan agrees: “It is good to put a face to a name and identify people with the jurisdiction. I believe that is the way we are going to raise the profile of The Bahamas and make inroads into new markets.” The minister believes it is particularly important for government to be visible on these trips, giving potential clients and investors confidence that the government is engaged at a grassroots level and supporting its own professionals. Strachan leads a small team from the Ministry of Finance at these events, selecting the most qualified to accompany her. “We need experienced people because you want to make sure they are able to interact in a meaningful way. They need experience and knowledge under their belt.” This year, however, the ministry has added a new component–adding one or two junior staff members to the delegation. The minister calls it an “invaluable learning experience” and says this type of exposure gives young professionals a better feel for the market and its issues. Appointed to the CEO position in December 2015, McCartney wants her tenure to be characterized by effective outreach and sees promotional activities as central to the BFSB’s mandate. “It is a 50/50 split between policy initiatives and promotional activities. We cannot let other jurisdictions get out there without us. We have always been a forerunner in financial services and it is important for people to know we are still fully engaged. We need to be visible and we need to be present to make sure The Bahamas is on everyone’s mind. It is about business development and awareness,” she says. 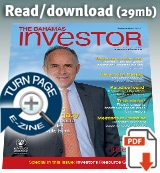 Another product push this year focuses on captive insurance. The Bahamas has welcomed captive insurance companies since the 1960s and McCartney says the industry is set for a resurgence. “Captives is a growth area. There is a renewed interest in the product.” In January 2016, a delegation from The Bahamas attended the World Captive Forum for the first time in the conference’s 25-year history. Strachan agrees: “There’s a lot of anecdotal evidence. We get a sense from the industry that the trips are extremely worthwhile and extremely valuable.